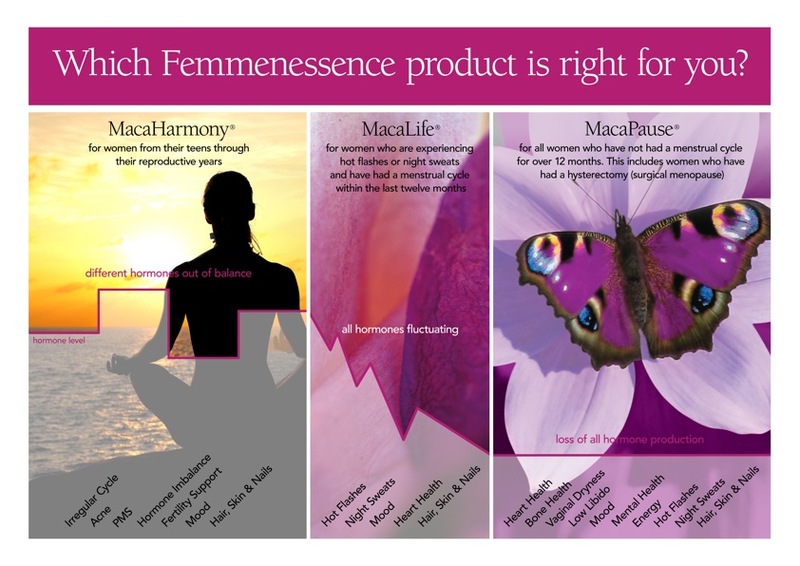 Femmenessence MacaLife is one of those tools, to support hormone balance and reduce menopausal symptoms in peri-menopausal woman. It is the first natural product to demonstrate in published clinical trials, statistically significant effects on hormones in peri and post-menopausal women. Most importantly, instead of introducing hormones into your body, Femmenessence nourishes your body's own hormone production, and nothing is more natural than your own hormones. Macalife is for woman who are experiencing peri-menopausal symptoms and are still menstruating, even if menstruation is irregular. 5 My nutritionist suggested femmennessence as I was having night sweats and hot flushes and hadn't had a period for 8 months. I started taking macalife on January 4th. By April 23rd I had a period and then was pregnant the next month! Was not expecting or trying to get pregnant! I am 43. Healthy pregnancy, due 28 Jan. Definitely recommend this product for peri-menopausal or anyone wanting to have a baby lol.